Environmental Protection, a comprehensive online, information resource for environmental professionals,recently announced the winners of its annual New Product of the Year contest, which attracted entries in seven award categories including environmental management, green technology, health and safety/cleanup, software/SaaS, soil and groundwater, wastewater, and water. WaterStep, a non-profit organization that provides safe water and health education to communities around the world, is pleased to announce that its new portable bleach maker won the award in the Health and Safety/Cleanup category. Most recently, the bleach makers were used in Haitian medical clinics and hospitals to treat displaced refugees following Hurricane Matthew. bleach maker, which is handheld device that can generate powerful disinfectant on demand. 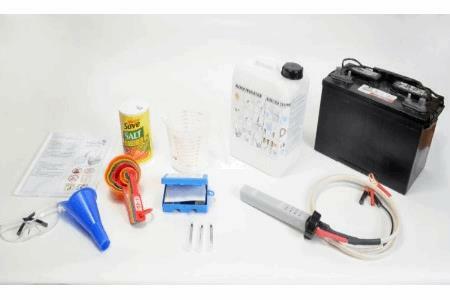 Using water, salt, and a 12 volt car battery, the bleach maker uses a process called electrolysis to create sodium hypochlorite, more commonly known as chlorine bleach. Bleach is used to sanitize hospitals and medical clinics and to disinfect cooking areas, cooking equipment, and clothing. The device was field-tested in several countries including Kenya, Nigeria, Costa Rica, Uganda, and in Ecuador following the devastating earthquake last April. The critical need for a simple and portable bleach maker became increasingly apparent when WaterStep received a request from organization Project Hope during the Ebola outbreak in 2014. The concept was further developed at Hack2o 2014, a hack-a-thon hosted by WaterStep and FirstBuild to create solutions to the world water crisis. WaterStep volunteers Frank Diebold, David Mekus and Dr. Joe Jacobi led a group of others from UofL, Louisville Water Company and General Electric's First Build Innovation Center who worked together to develop a very powerful disinfectant tool. "No matter our background, the year coming to a close and the idea of hope and a new beginning punctuates the crisp cool air around us. The team at WaterStep couldn't be more thankful to end 2016 by being recognized by Environmental Protection. We do not take this honor lightly, and it inspires our hope to see the day no child suffers from waterborne illness," said Mark Hogg, Founder and CEO of WaterStep. "Our 2016 contest attracted high-quality, innovative entries in every category, which is one more encouraging sign that the environmental marketplace is dynamic and growing. The competition was strong this year in categories such as health & safety/cleanup and wastewater," Editorial Director Jerry Laws said. WaterStep, headquartered in Louisville, KY, is a 501(c)(3)nonprofit organization that believes everyone should have access to safe water and that no one should suffer from waterborne illnesses. WaterStep implements water projects and equips people with tools and training in water purification, disaster relief, health education, and well repair. Since its founding in 1995, WaterStep has brought safe water to people in over 30 countries. For more information, visit waterstep.org.